In 1917, alleged fairies captured on film fanned a firestorm of public attention. Eighty years later, they made it to film again—as in movie. FairyTale: A True Story was the first big-screen adaptation of two WWI-era British cousins named Frances and Elsie and the five fairy photographs they snapped over three years. There is so much lovely about it. In honor of Fairy Spell, my 2018 book about the same, I will be running original interviews with the stars and story architects of FairyTale. It is unusual for a film to claim itself “a true story” rather than “based on a true story,” especially when the film takes considerable liberties (as this one does). In the film, Elsie is 12, Frances 8; in real life, Elsie was 16 and Frances 9 when they took the first photo. In the film, Frances’s mother Annie is dead; in the actual story, she accompanied Frances to Cottingley and also lived with the Wrights. The first scene focuses on the always-captivating Harry Houdini. However, he had no role in the actual story (which is plenty captivating without him). Later in the film, Houdini is used to implant Elsie with the conviction that it’s okay to keep secrets. Elsie did not have a brother, but the film gives her one—Joseph, who has died before the story starts. He is used to implant Elsie’s mother Polly with a “realistic” motive to believe in the unknown. In the film, Frances sneaks her uncle’s camera to take the first photo; in real life, she and Elsie asked and were begrudgingly given permission to borrow it. In the real story, Arthur Conan Doyle did not meet the girls. In the real story, Polly did not meet Gardner till 1920, by which time the girls had taken two photos. In the real story, it was not Gardner who accompanied the girls to the beck to try for more photos; it was a man named Geoffrey Hodson. In the film, Gardner is present when the girls take the third (of five) photos, which occurred in 1920. The film incorporates the story of Peter Pan and its familiar element of encouraging children to believe in fairies. 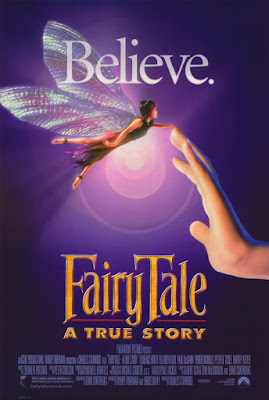 In the film, a reporter who breaks into the Wright home discovers the fairy cutouts (and sees the ghost of Joseph). Neither happened in real life. The film does not conclusively reveal how the girls staged photos. Haven't thought about this story in years but I remember reading an article and seeing some of the photos in Smithsonian Magazine a long time ago. A pretty clever prank for a couple of kids to pull off.